Gaye Tolan Hatfield, an Associate Professor at Berklee College of Music, is the sole instructor for the Ear Training on the Run series. 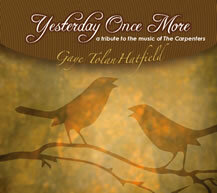 This album brings a fresh jazz/pop twist to the beautiful songs made famous by the Carpenters. Available at cdbaby. Ear Training On The Run is a series of audio courses designed to teach musicians and aspiring musicians to identify intervals, chords, rhythms and other basic elements of music.